Research shows that when dads read bedtime stories, their kids do better at school. 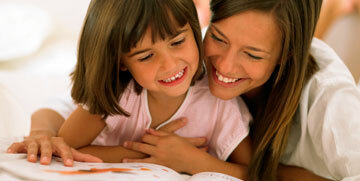 Bedtime stories encourage speech and language development and help children learn literacy skills in an enjoyable way. If nothing else, a story at snooze time helps set down healthy sleep patterns. Time then to tell some tall tales. Bedtime stories should be told in a relaxed atmosphere — so let's begin by switching off the TV. And, where possible, add some dramatization to the stories. Try reading in different voices or carry out some of the actions being performed by the characters in the book. Anything that makes it a more stimulating story will make storytime more fun. When your child's just learning to talk, regularly read the same story. This will help their language development and enhance their memory. The first time a child hears a story they won't catch everything — but hearing it over and over again helps them to become familiar with words and to establish speech patterns. Avoid turning storytime into an academic exercise by using it to test your child's reading skills. Instead, just ask open questions about the stories that help them build a link between the story and their everyday life. For example: "What would you do?" or "Do you know any other black cats?" It's even more important for dads to actively encourage their sons to read. Reading is often thought of by boys as a 'girly' thing to do — which may explain why lads do so badly in literacy tests — but if young boys see their main role model enjoying reading it'll encourage them too. In fact, it doesn't always have to be the Mr. Men stories. Reeling off your favorite line or two from a newspaper story, magazine, comic or match day football program will help them build an association between reading and fun. Spend some quality time with your children at the library. Look for books aimed at their age level and stories you enjoyed as a child. Let them choose books too — even if they pick one that's too complex for them but they like the pictures. Encourage them to browse and find stories they like the look of. Children who have favorite books when they are young tend to do better in school. Reprinted with permission from the UK's National Literacy Trust. www.literacytrust.org.uk/familyreading/Blokes.html. This article may be used for non-commercial purposes, on condition that the source is acknowledged.